cabin top/fuse join) and belly mounted (under the pilot seat) antennas. That is a very bad location for the AHRS. Suggest you consider leaving the antenna asis and move the AHRS back to the bulkhead where the rear seat belt shoulder cables attach. Build a shelf and sandwich it between the cable attach plate and the longeron top. This will move the AHRS back away from the baggage compartment that will create even larger AHRS interference depending upon the variable content of the baggage. I’m starting on my fuselage and want to get a head start on antenna locations by making doubler plates, etc for future mounting as it will be easier to drill/rivet them to the skin before they are final riveted in place. Comm antennas – going with two. Will mount bent whip on bottom of fuselage and/or top. Straight whip on top if I go that route. If I mount both on the bottom how far apart should they be to avoid/minimize interference? If I mount one on the top I’m thinking aft of fiberglass to avoid need for glassing ground place into the top. Thoughts? Comments? I like the idea of fabricating AHRS shelf in tailcone near bulkhead that seat belt anchors attach. Plusses/minuses of this location? Transponder – bottom of fuselage most likely opposite of center opposing location of comm. antenna. Again what is recommendation for location to avoid interference pattern from gear legs, etc. 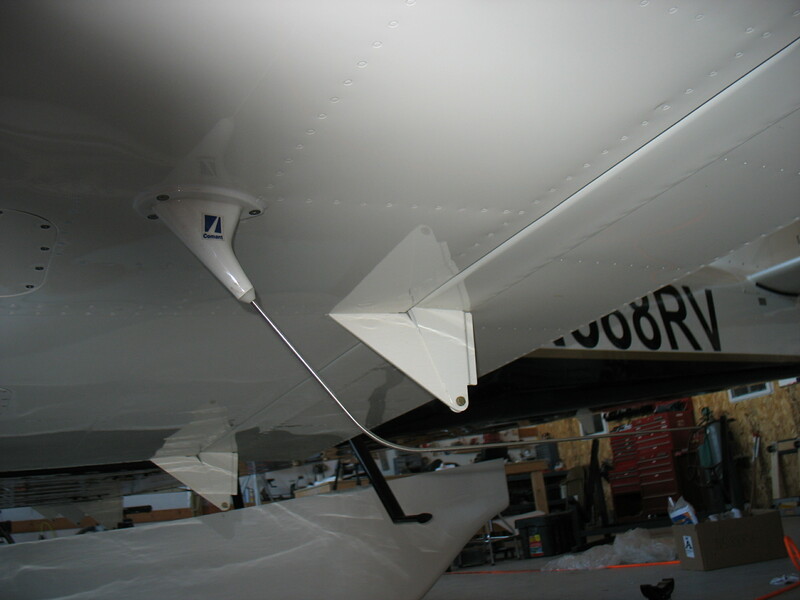 Localizer/VOR antenna – again dual – thinking internal wingtip in both wings. GPS – inside cabin top as I saw done somewhere on here. How far from Comm antenna if I have one of those on the top of the airplane. XM Weather? Not sure – maybe combo GPS/SM unit mounted as above. ADF – not going to bother. DME – nope. Maybe redundant GPS under cowl in front. ELT – not sure. Smallest antenna I can find mounted coming out empennage fairing? What sort of antenna does the 406Mhz ELTs take anyway – I need to look that up. Thinking is I will figure out mounting and buy antennas as I construct airframe with actual avionics decisions coming later once I get closer. But in general dual nav/com setup with Dual EFIS screens with some sort of redundant third screen slaved off either or. Brands to be determined but at least one Garmin 430 seems like one safe choice. Before you give up on the upper antenna you may want to consider other solutions. I have the same interference problem, but it is comming from my lower external antenna, I had no issues from the roof mounted antenna and my AHRS is in the same place as yours. I have been meaning to call GRT for a long time about this about shielding options or other suggestions but keep forgetting. Moving the AHRS might be the better option. Please post if you find a successful solution. 406MHz ELT's use the standard sized 121.5 MHz antennas, because the FAA still requires our ELT to transmit on 121.5 (even if it also does 406). I think there may be some misconceptions about interference caused to the Magnetometer vs the AHRS. I had both my magnetometer and AHRS mounted on a tray in the same location as most other builders ie connected to rails that span the fuse longerons at the bulkhead just forward of the cable attach points. This is well clear of the battery and main relay which typically cause interference to the magnetometer. Contents of the baggage compratment (eg tools or other iron content) will affect the magnetometer but not the AHRS. But my GRTs indicated an intermittent 'lean' during flight, and since my Comm2 antenna was within 2 feet of the AHRS and magnetometer, any tx on Comm2 caused the attitude indication to go nuts. At the time I was contemplating a solution, GRT advised NOT to mount the AHRS and Magnetometer close together. So I moved the magnetometer to the left wingtip. I seem to have cured the dose of the 'leans'. But tx on Comm2 causes the AHRS to reboot - a much worse situation than before. I believe this is because the AHRS is within 2ft of the Comm2 antenna. Pushing the AHRS further aft is an option, as is moving the antennas. I was just looking for experiences with mounting the antennas on the wing inspection plates so I could weigh the options. We relocated my bent whip antennas to make room for my belly pod. The avionics shop installed doublers and mounted them immediately behind the wing plates. The particular doubler design was not easy to fabricate but it ties into the structure and makes a very strong mount. They seem to work very well at that location and I haven't had any trouble with my radios.